Developers looking to enhance Web and other applications with dynamic PDF document generation and/or manipulation will find this book unique in content and readability. Imagine a publisher who wants to stamp his ebooks on the fly with the name of the buyer (to discourage sharing). Such a publisher would (and we know one who does) use iText for the task. Developers looking to enhance web- and other applications with dynamic PDF document generation and/or manipulation will find this book unique in content and readability. Based on ongoing examples that encourage learning in action, they will finally understand PDF and learn how to build applications that produce professional, high-quality PDF documents. While the basic functionality of iText is easy to acquire, this book lowers the learning curve for more advanced functionality. 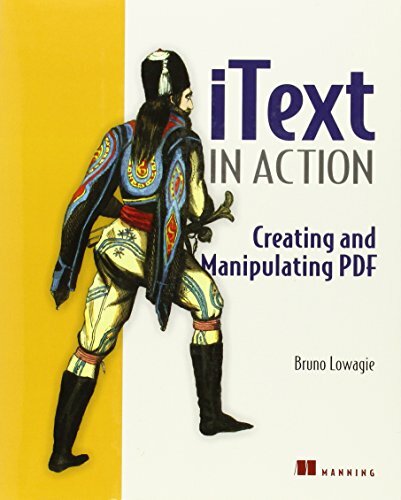 It explains how to use iText to create/manipulate PDF documents on-the-fly in one or more of the following situations: Due to time or size, the PDF documents can't be produced manually. The content of the document must be calculated or based on user input. The content needs to be customized or personalized. The PDF content needs to be served in a web environment. Documents are to be created in batch process mode. All the examples are written in Java, but they can be easily adapted to .N ET by developers using one of the .NET ports: iTextSharp (C#) or iText.NET (#J). While iText is a free Java library and the examples are written from the point of view of the Java developer, nine out of ten examples can be run by .NET developers without any changes.